Invitation Letter for Cheque Distribution Ceremony for employees, visitors, winners, sports, toppers, clients, franchise staff, prize distribution and other events. The office bearers and Executive Committee members of LCCI are pleased to present their humble contribution vide Cheque No. 348578 dated 17 August amounting to Rs. 130,000/- as a donation for the noble cause of helping the ailing humanity. It is an effort to fulfill our cooperate social responsibility. 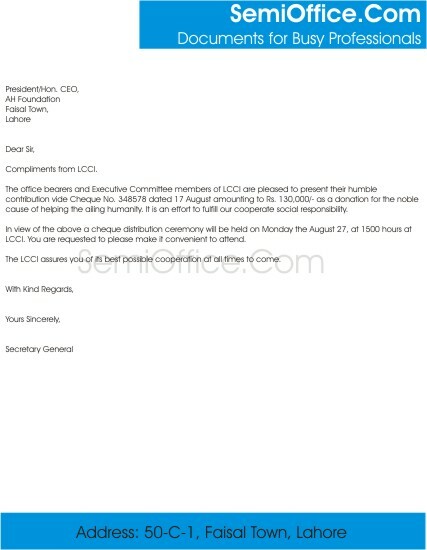 In view of the above a cheque distribution ceremony will be held on Monday the August 27, at 1500 hours at LCCI. You are requested to please make it convenient to attend. The LCCI assures you of its best possible cooperation at all times to come. It is a pleasure to inform you that you have been selected for the merit based scholarship under Governor’s Literacy and formal education scholarship program. The cheque distribution ceremony will be held on Oct, 15th in parade ground at 1600 hours in which the Governor will distribute the cheques to the qualified persons himself. You are invited in the ceremony to receive your scholarship cheque. Please do not forget to bring this invitation letter with you on the said day otherwise your entry will be banned. You are requested to take care of the time.